Three designers. Two week Agile sprint. 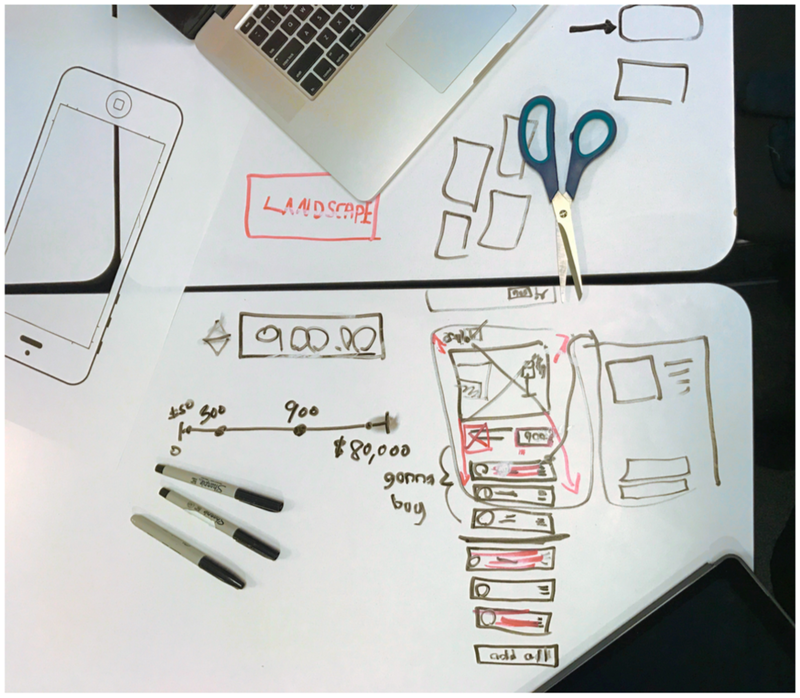 While a UX Design Student at General Assembly my team and I were challenged to build a mobile app that would influence customers to buy all their home goods through Target. I distilled this into a vision where a user could outfit an entire room from the Target app while on their bus ride to work. 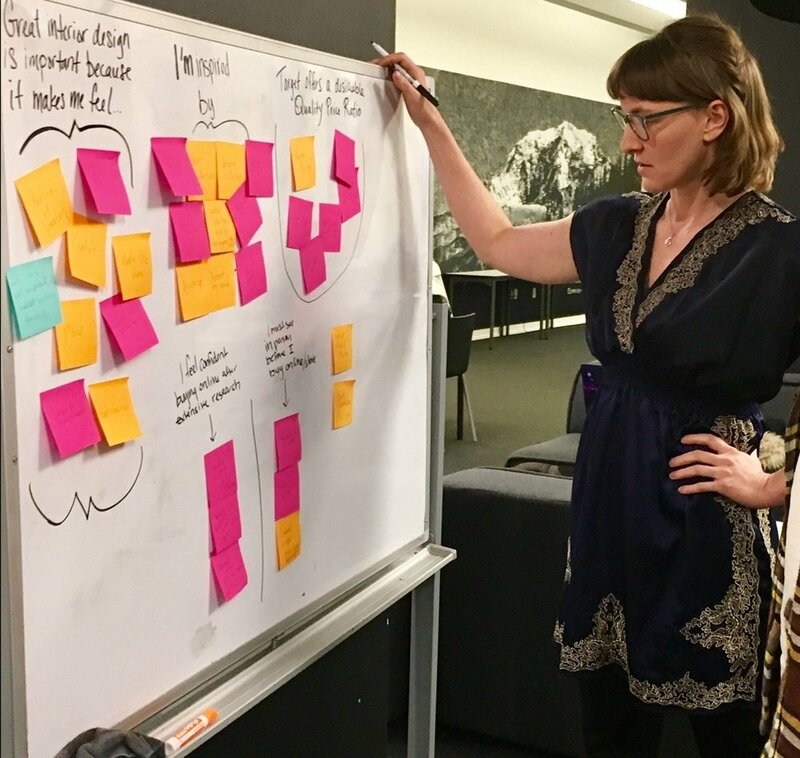 The challenge was to design a mobile app experience that would allow customers to shop at Target for all their home goods needs, while also offering the ability to discover limited-edition collections by featured designers like Emily Henderson and Dwell Magazine. Create a choose your own adventure shopping experience using a masonry layout, with pricing and product dimensions that are creatively woven into an immersive design. Competitive and Comparative Analysis of existing interior design platforms and competitors in the home goods market space. The people I interviewed are budget conscious and seek inspiration through Pinterest and designer blogs. They go to Target looking to find designer items at great prices. One of their biggest pain points is imagining product dimensions while in the store. Research participants tipped us off on an almost identical desk at Target for nearly $500 less than West Elm. From this research I was able to define our primary persona, Kate. She's a Target Loyalist who has a well-established trust in the brand. She's inspired by Pinterest and designer blogs and loves shopping at Target. Create an MVP to quickly validate the feature. Make it effortless for the user to outfit an entire room through their mobile app. Our initial sketches included a full page bleed of a designer room, with the ability to scroll down and add the products in the room directly to the shopping cart. My team was on a super tight deadline, creating the prototype over the weekend in order to begin testing at the beginning of the project's second week. Therefore the decision was made to design directly in Axure to save time. We were working with Target's flat design which made this decision a success. 1. All rooms in the browsing experience include Target products. 2. The masonry layout is a familiar and engaging experience for users. 3. Featured designers are highlighted using their logos. 1. All products can be purchased directly through the mobile app. 4. Link to the designer's featured page showing her how-to videos and favorite products at Target. 5. The list view of the products in the room. 6. Adding items to the cart or shopping list is effortless. I then led the testing of our prototype by interviewing five users who fit our primary persona. This test validated that users enjoy browsing designer rooms to inspire their design choices through the app. The users also loved the full catalogue page. 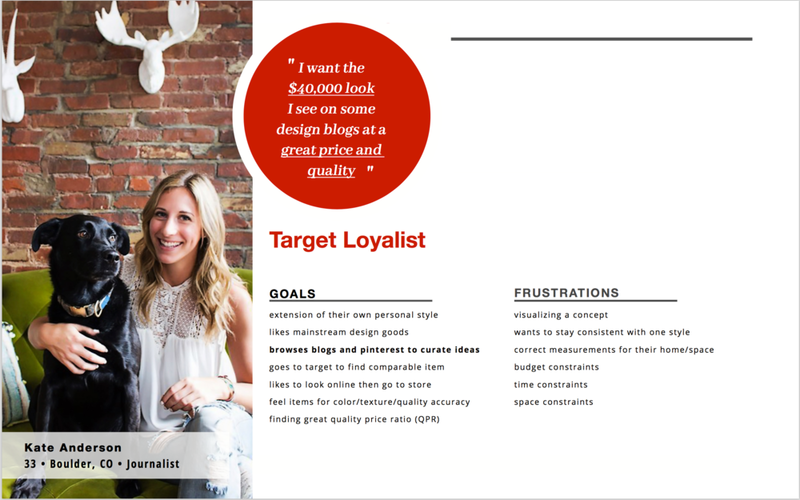 I standardized the designer cards, as they weren’t clear to our users that they focused on Target’s featured interior designers. I also increased whitespace to lesson cognitive load in the masonry browsing experience. Many of our users requested the ability to zoom in closer to featured products, so we built a slider into the full-bleed catalog page. Feedback from our users was that they loved the increased immersion into the designer's room. My team and I created an immersive mobile app that Target can launch via their native mobile app. The user experience allows customers to discover inspiring room designs and then outfit an entire room while on their bus ride to work. 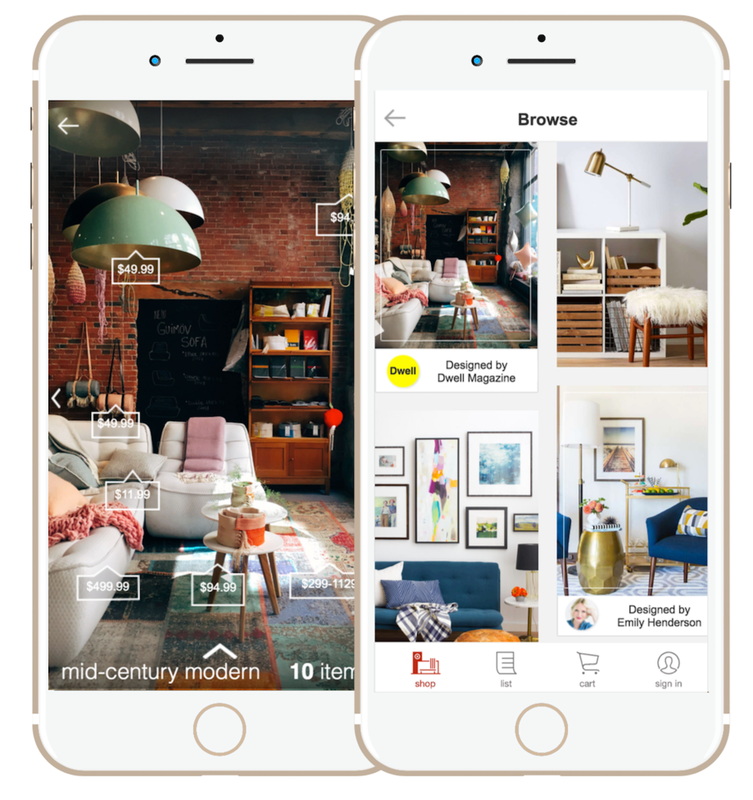 Customers are also introduced to Target’s featured designers, and can buy their products directly through the app.